In Budget 2015 new tax benefit is announced for NPS – new pension scheme, this makes NPS more attractive from investment point of view. 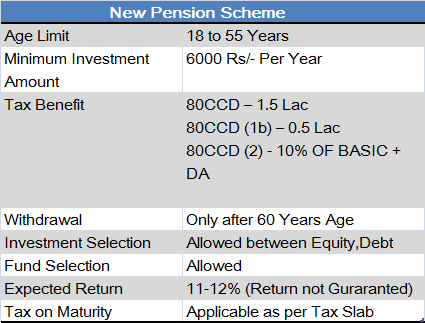 Let’s take a quick look at new pension scheme and applicable tax benefits. New Pension Scheme is retirement saving pension scheme launched by government of India. This scheme is also known as national pension scheme. This scheme is regulated and administered by PFRDA. Under NPS subscriber is free to select investment option and fund manager. Investor can choose whether to invest in equity, debt or government securities, not only that subscriber can select investment portion also. This make this scheme unique from investment point of view. Under NPS return on investment in not guaranteed, however it is expected that return will be in range of 11-12.5 %. 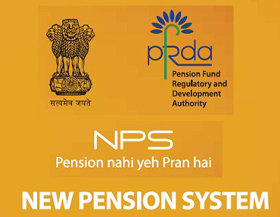 How to open New Pension Scheme (NPS) account? NPS account can be opened at designated post office or banks. Any Indian resident from age 18 years to 55 years is eligible to open this account. In order to open New Pension Scheme account PAN card is mandatory. Minimum investment amount for NPS is 6000 Rs/- in a financial year. There is no upper limit for investment in NPS, however tax benefit will be applicable as per rules. Life stage investment option is for individual who cannot track their investment or cannot decide allocation of investments. Under this option equity investment portion varies automatically based on age of individual. Higher the age lower the equity investment. As mention above you have option to select from six available fund managers. You can even shift from fund manager to fund manager. This switching is allowed once in year. New pension scheme does not allow subscriber to withdraw money till 60 year of age. No partial withdrawal option. Withdrawal amount and maturity amount under this scheme is taxable. No tax benefit is yet extended on maturity. Should you invest in New Pension Scheme? Few days back NPS was not at all attractive option, but after announcement of tax benefit in budget 2015 NPS became talk of the town. This investment option became attractive because now it gives additional tax deduction benefit of 50000 Rs/- under 80 CCD (1b). According to me tax benefit should not be only reason for making investment in NPS. You should select NPS if it suits your risk profile and investment goal. NPS or ELSS – Where to invest money for the better return? EPFO New Rule – How to get 8.16% Extra Pension for a lifetime? Premature withdrawal is allowed but 80% of the withdrawal should be used to buy annuity plan from the insurer.